Posted in General Health & Wellness on September 7, 2012 by FloridaHealth.com staff. Last modified on December 02, 2018. Read disclaimer. Sweat -- it is the ingenious way our bodies have of keeping us cool during hot weather and strenuous physical activity. As perspiration flows from the 2-4 million sweat glands onto our skin, air blows across it causing evaporation, which cools our body. Many mammals have far fewer sweat glands than us. That's why, in order to stay cool, dogs pant (though dogs and cats have sweat glands in their feet), pigs wallow in water (their sweat glands are in the nose), elephants fan their huge, vascular ears, bears are more active at night, and rats burrow or seek shade during the heat of the day. Unfortunately, since the late 1950's when deodorant advertisements became common, most of us have come to associate human sweat with something far more sinister -- body odor. The	following mini quiz will help you learn more about sweat and how to control body odor. Actually, most body sweat is produced by the skin's accrine glands and contains little more than water and salt; it has no odor. There is a second type of sweat gland, however, called the apocrine glands, found mainly in hairy areas like the scalp, arm pits and groin, that work differently. Rather than serving to help regulate body temperature, the apocrine glands are activated by stress, physical or sexual excitement or hormonal changes. The sweat they produce contains fatty acids and proteins which become a smorgasbord for the bacteria that naturally exist on our skin surface. It's these bacteria that are responsible for the unpleasant smell of BO. 2. I use a deodorant or antiperspirant. Can anything else be done to control BO? bathe with soap and water and wear clean	clothes	at least once a day and always after exercise. The	longer	that bacteria is able to grow and feed on the fatty sweat of your underarm and groin areas, the worse you're going to smell. After showering, dry off well before dressing since bacteria thrives in warmth and moisture. personal hygiene tips: If you use an antiperspirant, do not apply it immediately after showering while your body is still damp. Antiperspirants contain aluminum or some other compound that causes sweat ducts to swell when we perspire, thus preventing sweat from reaching the skin surface where it would interact with bacteria. Antiperspirants are most effective if applied when you're completely dry so that the antiperspirant can better stick to your skin. Better yet, apply antiperspirant at night when you're least likely to be sweaty. Deodorants, on the other hand, do nothing to prevent sweating. Their intent is to make the skin surface inhospitable to bacteria. Looking for a natural, deodorant option? Mineral crystal deodorant stick work by creating a protective, salt barrier between your skin and odor-causing bacteria. shave your underarms. The less hair for bacteria to adhere to, the easier it is to wash the bacteria away. reevaluate how you are cleaning your clothes. One doctor reports that simply changing laundry detergent can make a world of difference in body odor production. And, if you have a high-efficiency, water-saving laundry washer, you may notice a difference by presoaking clothes before washing. reexamine your diet. Eating foods like raw onions, garlic and curry can influence your body odor. Also, eating meat may contribute to bad BO. If spicy foods cause you to sweat profusely, consider cutting back on these. Drinking plenty of water and green tea and eating a diet rich in fruits, dark green, leafy vegetables and whole grains supports overall health, may help you to better manage stress and reduce body odor. learn skills for managing stress. Our apocrine glands, the ones that produce the more problematic type of sweat, tend to become more active when we are stressed. wear loose-fitting clothes made primarily of cotton or other natural, breathable fabrics. 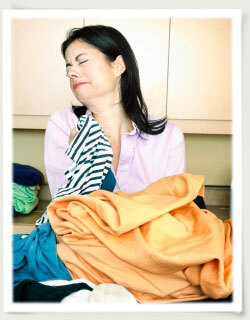 Tight fitting or synthetic-fiber clothes tend to trap in moisture and prevent your perspiration from drying. consider adding an underarm sweat guard to suits, sports jackets or garments that can not be washed frequently. discontinue smoking, drinking alcohol and coffee, or using recreational drugs. Also, exposure to toxins and consuming certain nutritional or medicinal herbs can effect your body odor. talk with your doctor if you notice a change in your body odor. Many serious medical conditions, such as diabetes, heart, kidney or liver disease, hormonal imbalances and certain cancers can influence the smell your body emanates. Up to 1/3 of us lack an enzyme that metabolizes a compound called trimethylamine (TMA) which can cause a garbage-like or fishy smell. There is no cure for this but it can be managed with diet, medications and lifestyle changes. remember that it is normal for humans to emit some level of body odor. 3. What percentage of your body's sweat glands are found in your feet? One-fourth (25%) of our sweat glands are in our feet. So, it's little wonder that a persons socks and shoes often stink. To minimize your chances of developing sweat-related odors, athletes foot and blisters, wear cotton socks and shoes that allow your feet to breathe. Some shoes feature materials that permit sweat to evaporate faster. Or better yet, just slip your shoes off when possible or wear sandals. Also, wash your feet well when showering. 4. What should you do if a friend or coworker has an ongoing problem with BO? One component of body odor is called androstenone and it appears that only about half of us are able to detect it. So it is possible that the friend or coworker may not be aware that they have a BO problem. Unfortunately, research indicates that those of us who CAN smell androstenone tend to think less favorably of those who emit it. Not sure how to bring up the subject? The University of Central Oklahoma offers tips for how to discuss the subject of body odor with coworkers. 5. As we get older (ages 75+), our body odor tends to be ____ offensive to others? While all of us have our own, unique odortype (which explains why scent dogs can follow the track of an individual), in general, the body odor of older people tends to be more mellow -- both in intensity and offensiveness. Here's a novel idea... perhaps we smell like sweat because we bath too often and too aggressively... rather than not enough! Their research also shows that the bacteria that cause MRSA, acne, eczema and other skin conditions may also be controlled by supporting the healthy bacteria on our skin. I've heard that antiperspirants can block up our sweat pores which, I guess, is a bad thing, so deodorants may be safer. Do anyone have an opinion on this? Thanks for your question, Willie. It appears that you are correct in the way antiperspirants work -- they usually use aluminum based ingredients to obstruct sweat glands. Deodorants on the other hand, either decrease odor-causing bacteria or mask them with fragrances. While concerns have existed about antiperspirant and deodorant ingredients increasing one's risk of developing breast cancer or Alzheimer's Disease, the research has been mixed and inconclusive. So, in the opinions of the FDA and the National Cancer Institute, both antiperspirants and deodorants are generally safe. The most common side effect appears to be allergic reaction to the products' fragrances and/or propylene glycol (a solvent with moisturizing, antiseptic and preservative properties), essential oils, parabens (a class of preservatives that, at high levels, could possibly increase a risk of breast tumors due to their weak estrogen-like properties), vitamin E and/or lanolin. If you suspect that you may be sensitive to any of these ingredients, consider using a natural, solid salt crystal deodorant (which works by making the treated area inhospitable to odor-causing bacteria) or a low-allergenic antiperspirant or deodorant product.